The Philippine shoes project started as a conversation between Caribou’s Craig Thomas and the Principal of a school in Bulacan, Philippines. Sponsorship programs in Principal Bautista’s school cover the cost of school resources, uniforms, meals and health cover for the students… but they don’t pay for shoes. Many families in the area can’t afford to buy shoes for their children; they have no choice but to let their kids go barefoot, often resulting in hookworm or other parasitic diseases. Craig and his team took the initiative to start a project raising support and putting shoes on the feet of these children in need. The project is at work in two schools in Bulacan, roughly four hours’ drive north of Manila city, with 350 students between them. It aims to provide shoes for every primary school aged child in attendance. When BEC heard about the project, we immediately jumped on board, and you can too. Every $10 provides a pair of shoes for a pair of feet at risk, giving invaluable protection from parasites. 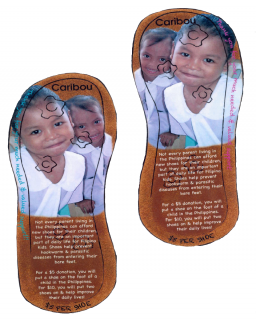 To help put shoes on the feet of children in the Philippines, please contact Craig Thomas at Caribou Lighting (craig@caribou.com.au). Your support will help make a difference to these children in need.